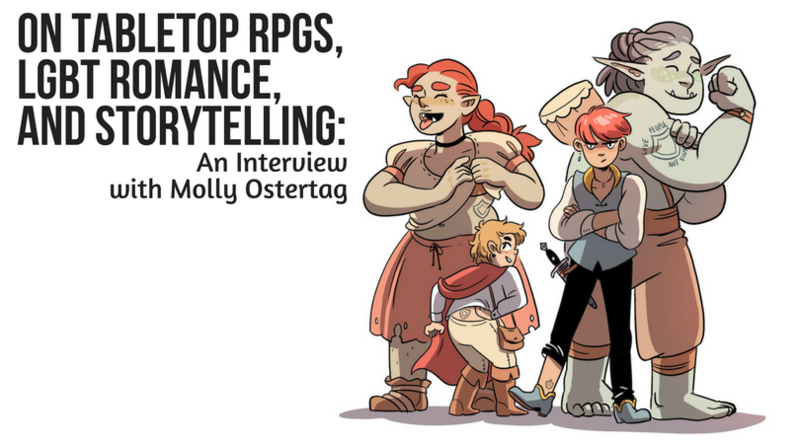 When it comes to infusing her stories with LGBT and gender non-conforming themes, writer and artist Molly Ostertag is no stranger. Her most recent graphic novel, The Witch Boy, tells the story of a boy in a magical society who gains aptitude with spellcasting – despite the fact that all male-identified people he knows study shapeshifting. Outside of comics, though, Ostertag is also an accomplished roleplayer. She’s been featured on the renowned actual-play tabletop series Critical Role, and has recently become the Dungeon Master of her own streaming tabletop RPG series, Pilgrimage. Ostertag later developed roleplay skills at a unique LARP (live action roleplay) summer camp, and continued to delve into the world of Dungeons and Dragons in high school, where she developed her first lasting character, Aurelia. It’s always tough on players when a campaign ends — the bond created between those people who share such an intimate storytelling experience is like no other. Still, Ostertag said she still maintains these feelings toward her fellow players and the DM from that campaign, despite the story ending when she moved away from New York. These themes are something she’s also weaving into her new Twitch streaming campaign, Pilgrimage. Pilgrimage tells the story of four heroes who have absorbed part of a demon and gained mysterious powers in the process. The demon slowly kills them as they move through the world, and their only hope of survival is to visit all six of Faerun’s temples to receive blessings from the gods. The catch? If they die, the demon will be released to consume the world. Ostertag said she created this hook to give the players “a life-or-death reason […] to have to stick together, even if they had huge personality conflicts”, a common issue in both homebrew and officially-published Dungeons and Dragons campaigns. Putting various player-created characters together without a clear path ahead can always be difficult, but Ostertag mentioned that a ‘found family’ theme has organically developed through gameplay in Pilgrimage. 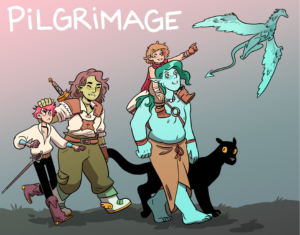 The Pilgrimage players have experienced various conflicts in their adventure, including starting a war, being pursued by a cult, swapping bodies, and revitalizing an ancient religion. “We’re having an amazing time,” Ostertag said. Hasbro subsidiary Wizards of the Coast, the official publisher of Dungeons and Dragons, encourages “queering characters” with the current Fifth Edition (5e) of the game, where players are encouraged to think more wholly about their characters and play people of varying genders and sexual orientations. It’s a sentiment I can recognize in my own home game as well – and something I really value in RPGs. For queer people, it’s extremely validating and welcoming to see players that look and feel like them in fiction, and this extends to stories we tell around a table (or on Skype) with our friends. She said she’s also interested in including romance storylines for her players, though finds that “it can be a little awkward to play it out at the table.” Nonetheless, Ostertag said she still brainstorms ways to include romance, as most of her favorite works of fiction have included romance plots. Fortunately for her, there are various game systems to tell collaborative stories in, and some of these feature romantic storylines as a key element. Besides Dungeons and Dragons, Ostertag has also expressed interest in Monsterhearts, a game directly inspired by the experiences of queer youth. Monsterhearts is an indie game run on the Powered By The Apocalypse system developed for Apocalypse World, one of the original indie tabletop roleplaying games. Players build paranormal ‘monster’ characters typically seen in supernatural stories, like werewolves or vampires. These characters reflect the experiences of creator Avery Alder, and those of queer teens worldwide, who also often have to keep their identities a secret. Alder goes on to describe how in various situations, queer people are made to feel ‘monstrous’. Monsterhearts deals with this topic directly, as it’s set in a high school. Players are encouraged to create queer stories for their monsters and play out romantic storylines with their fellow players right at the table. Ostertag said she likes the idea of exploring teen drama in fiction, and says that she’d like to explore Monsterhearts someday. She said, “I ran a D&D 5E campaign last year that was set at a high school for adventurers. It was fun but had some flaws – a static setting is surprisingly hard to pull off [in Dungeons and Dragons], or at least it was for me.” Still, she said the “tiny self-contained bubble of high school” settings appeal to her. For updates on Molly Ostertag and her work, follow her on Twitter. You can also check out her work, including comics, at her website. For updates on Pilgrimage, follow the campaign on Tumblr.